Twine Table is a series of tables inspired by one of mankind’s most simple inventions: the button. The table top is an over-size button, whilst the metal wire pierces and twists around the surface to create an elegant base. A playful and nostalgic addition to any interior. Available in a range of colours. “The idea of the tables arose when the designers, Lisa and Anna, were looking into the world of construction. They had recently been working with some embroidery for an exhibition, and they asked themselves – is it possible to stitch a table together? Inspired by the idea of needlework, they passed a metal wire through a table top. The wire then became the legs as well as the structure. 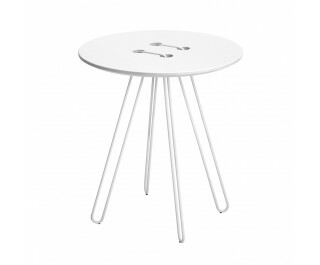 The playful Twine Tables, in the shape of a button, are completely at ease by a sofa, an easy chair or just by itself”.